The Fluke 80PK-8 Pipe Clamp Temperature Probe is a Type-K thermocouple designed for fast temperature and superheat measurements of pipe surfaces. With a 1-meter (39-Inch) lead, the probe has a measurement range of -29 to 149 Degree Celsius for pipe diameters 6.4 mm to 34.9 mm (0.25 to 1.38-Inch). The probe has a durable ribbon sensor and the measurements are repeatable. 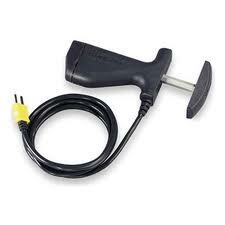 The Fluke 80PK-8 Pipe Clamp Temperature Probe is sold as one item per package. Expand your testing capability or update your tools with test lead sets and kits. Designed for industrial, electrical, and electronic needs, the collections range from starter to master test lead selections. Because they are an integral part of the complete measurement system, worn or under-rated test leads can cause inaccurate readings and pose a serious shock or electrocution hazard if live wires are read as being de-energized. To avoid these risks, use the correct test probe for the application. Fluke Corporation is the world leader in the manufacture, distribution and service of electronic test tools and software. Since its founding in 1948, Fluke has helped define and grow a unique technology market, providing testing and troubleshooting capabilities that have grown to mission critical status in manufacturing and service industries. From industrial electronic installation, maintenance and service, to precision measurement and quality control, Fluke tools help keep business and industry around the globe up and running. 190 TruReward$ points will be placed in your account when you buy this item.